It’s not a long time ago when building a fully functional and professional website using WordPress was a developers job. But now anyone with a basic understanding of Website can create a website without even knowing a single line of code with the help of drag and drop builder. A few years ago building a WordPress page was time-consuming. Though you have excellent knowledge of HTML & CSS, every time you needed to start from scratch. In this process, many of you couldn’t concentrate on more work or project. Then the game changed. Developer introduced shortcode and following the path, drag and drop builder for WordPress. Page builders are tools that allow anyone to build attractive and interactive web pages using a user-friendly interface. It helps expert developers build web pages quickly and beginners to create stylish web pages they couldn’t have on their own. In this system, you drag and drop elements to create appealing web pages. The important feature is most of them works with almost every WordPress theme available in the market. Nowadays drag and drop builder is viral among WordPress industry as it serves more value and gives more time to the developers. As the idea gained very much popularity in a short amount of time, there was a lot of drag and drop builder for you. And maybe you encountered with one of them already. Maybe it didn’t fulfill what you wanted, or maybe it did. And as there is a lot of them around you, it can get staggering to choose the best one from tons of page builder. 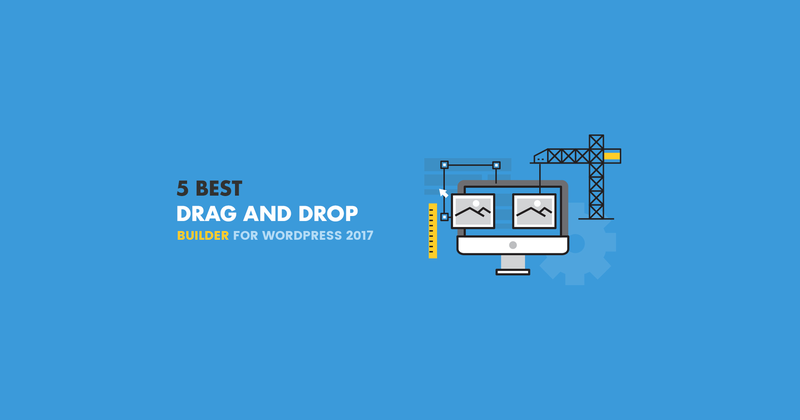 So, we decided to choose 5 best drag and drop builder in 2017 for you. You can check this list and find the perfect match per your requirement. This question must be answered before we go any further. Because without knowing the criteria it’s not worth for you to look on the list. So what have we looked at? Ease of Use- It is the first thing we looked into when we were choosing the builders. If these aren’t easy to use, there is no point to use one of these. Elements- Drag and drop builder uses its unique elements (also referred to as blocks, modules, or widgets). It is important that you choose a solution that has everything you want, whether that be tables, styling, media support, or whatever. Interface- User-friendly, non-glitchy interface is necessary for a drag and drop builder. Though you need to spend some time learning the interface for the long run, the easier it is, the better. You surely don’t want to waste time behind the interface. Elementor is an authoritative drag and drop builder though it’s relatively new on the field. It came out in June 2016. And since it’s release, it has achieved reputation among developers. After the release, it has downloaded over 807,835 times. Originally, there was just the free version at first. Now, the mother company Pojo has released Elementor Pro, which offers some truly exclusive functionality. Elementor uses a vivid user-friendly interface. The interface allows you to edit your web pages at front-end. Currently, the page builder comes with 28 great elements. These items allow you to create useful web pages. You can buy the pro version at $49 for one site. There are 20+ beautiful page templates designed for a professional look (Pro version). Additionally, you can customize and save your templates and reuse them later. Comes with 28 widgets which are quite enough for customizing web pages. Beaver Builder is another popular drag and drop builder. Over 375,000 WordPress websites have built with Beaver Builder. Amazing thing about Beaver Builder is, it works with your existing website. Beaver Builder’s front end interface gives you full control over your page layout. Templates of Beaver Builder make designing easy. You can save your designs as templates, and reuse them all over your site, or export them to use on a different site. Beaver Builder has deeper integration with WooCommerce plugin. Designing eCommerce pages are easy with this plugin. Developers can easily extend and customize the plugin through widgets. Divi is one of the earliest players in drag and drops builders field. That’s why it has a huge amount of content modules. Elegant Themes made the plugin. It powers the modern Divi theme. All these times Divi had been criticized for not having front end editing system. With the release of Divi 3.0, they answered the criticism. Now, this plugin has both front-end and back-end editor. While the front-end editor will help you to make live changes, the back-end editor will allow you to get the perfect layout. Create any type of design with 3 section types, 20-row types, and 46 content modules. If you are good at writing beautiful CSS codes, get your hands dirty. It has options for custom CSS. Divi has lots of options that let you build anything, any design you can imagine. It’s developer-friendly and suitable for professional websites. Access to more than 87 themes and 3+ other plugins that come with an Elegant Themes membership. Cornerstone is a front-end WordPress page builder that will change the way you create pages. It’s new on the market but drastically gained popularity. Cornerstone is the primary power source of ‘X’ theme made by Themeco. Cornerstone is a collection of shortcodes which can be utilized to build complex page layouts. It makes WordPress practical for any types of sites by enhancing its content management capabilities. The plugin has Skeleton Mode. It allows you to visually see the structure of your entire page without leaving the front end interface. Thrive Content Builder is the last drag and drop builder on our list. But it’s not the least one. This plugin is used by 45,715 people currently. It is a front-end content builder which actually offers “what you see is what you get” functionality. Thrive Content Builder has a user-friendly editor. It was developed specifically for online marketers. So, it has lots of unique features. It can be used to create home pages, professional blog posts, video pages, contact form pages, and more. Highlight important parts of your content with a (fully customizable) content box. Drag and drop builder providers know the importance of testing their product before buying. That’s why they provide da emo version to try. You can also try their free version if available. Did we miss any of your favorite page builders? Share your thoughts with us in the comment section and feel free share this post to your friends.